I was at Costco last weekend and I walked past a large bag of Hershey's individually wrapped chocolates that were calling my name. The Hershey's chocolates were (1) all natural (2) dark and (3) came in a really interesting assortment (pure dark chocolate with pomegranate flavored pieces, pure dark chocolate, and pure dark chocolate with cranberries, blueberries and almonds). I ended up buying the bag, and I have to say that the one with the cranberries, blueberries and almonds is by far my favorite since it is so crunchy and delicious. I'm a huge fan of dark chocolate -- it contains more of the cacao bean's antioxidants than milk chocolate, and they are known to help lower blood pressure and protect against heart disease. Each of the 10 gram chocolates (a convenient one or two bite size -- much bigger (although flatter) than a Hershey's miniature) in the assortment is only one weight watchers point, at 42.5 calories, 3.25 grams of fat, 1 gram of fiber, 3.5 grams of sugar and slightly less than 1 gram of protein. These chocolates should be very accessible either at your local grocery store, or at Costco, Walmart or Sam's club. If you like dark chocolate they are definitely worth checking out! Yummy... I like the Hersey's Dark Chocolate line too. I've tried the raspberry flavored one and it's decent. I've never thought you can find good healthy product in Costco!!!! But this one definitely sounds good! I love dark chocolate! There are so many fans of dark chocolate but my taste buds cannot endure it. My buds act like they're being tortured at Guantanamo Bay whenever I take a bite. I give up. But I'm glad everyone else is happy. Enjoy! oh my god! Thank you! Thank you! I LOVE dark chocolate, but I will admit, it took me a while to get used to it! Ooh these are tasty! When I was reviewing them I just had the pure dark, raspberry, and pomegranate. I like the pomegranate ones the best. Chocolate is my fav. thing. nice posting and thanks for sharing this with us. You don't have to twist my arm to convince me that these would be good. YUM! I really like these too, the nut and berries is my fave. Um...cool,but...I would point out for the sake of accuracy that the word "natural" isn't regulated as a label. So it really doesn't mean anything. My mom bought a couple of these and said they are really scrumptious. I really don't like chocolate, but I thought I should share her opinion. Its great to know we can all diet and still fit in a bot of chocolate!! 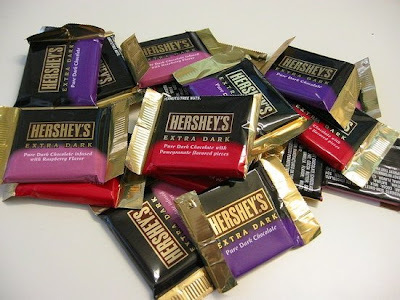 Thanks for the post, and Thank You Hersheys!! !